Who’s up for some outdoor ball play? Not a very busy weekend but the bears are playing volleyball this Saturday afternoon in Sunnyside Park! Come and join us! Darlings, come and fill us in on all the goings on in your life as your working your way through the holidays. For real! Mother Nature had been very kind lately, so let’s take advantage of this great weather and play some VB! Everyone is welcome to join us. We are a not-so-competitive group that gets together to exercise and to catch up with each other. We usually gather for dinner afterwards at places that don’t mind having hungry, tired, sweaty and hairy gays in their restaurants. Join owner, Jeff Edmondson and hotty bartender Wade, weekly for the Bear Happy Hour, each Tuesday from 4-7pm. Wade and Jeff will be behind the bar, slinging drinks and Chef Dorothy will be in the kitchen serving great happy hour eats! Tuesday is also “Taco Tuesday” at Woody’s, featuring $5 Taco plates. And at 6pm Jeff hosts the Trivia Battle. No cost to enter, but we’re giving away lots of cool stuff to the weekly winners. You gotta eat after work. May as well come to Woody’s for cheap eats and drinks, cool trivia and and prizes, and great hang out time with the Bears! There are currently no Bear Mafia events scheduled for this evening so it might be a great time to check out the new video bar Industry at 3700 Broadway in KCMO. Check out the slushies! Also, Hamburger Mary’s is having Charity Bingo to raise support for the Luv4Pugs animal charity starting at 8pm! Saturday is a busy day! There is still plenty of time to get involved to help us put on Bear Crossing KC 2014! Message Matt Stanley on Facebook if you are interested in finding out how you can be involved! We hope everyone had an amazing 2013 and we are looking forward to an unbelievable 2014 as we celebrate 5 years of the KC Bear Mafia! Don’t forget to like us on Facebook and follow us on Twitter to stay connected to all the latest Bear Mafia news and updates! A big welcome to all the new members who have liked us on Facebook and joined the group! We can’t wait to see you at the events! Sorry for the hiatus as we’ve been working on some of the big things coming your way next year-that being the Bear Run that will help us celebrate our 5 year anniversary. Hamburger Mary’s has a fun packed night for you-first with Mary’s Big Game show https://www.facebook.com/events/420735071386195/. Followed by Fast Times at Hamburger High. https://www.facebook.com/events/181201118749958/ Looking for something fun to do be sure to come on down and check it out. Join the KC Bear Mafia as we head north to hang with some Big O Bears. Join us as we party with the newly formed Big O Bears of Omaha. No Bear meet up would be complete without food. So we are having dinner at Spaghetti Works at 5pm. Then join as we take over The Maxx. https://www.facebook.com/events/518359998255192/Don’t miss out on a fun night our of town. Welcome new members Allan Russell, Norm Melichar, Jon Colvin, Ronnie Lathrop and John Coulter. We certainly hope you guys can join us at one of the above events or one in the future. Stay home and do nothing this weekend?? Furrgetabout!!! Good Morning Bear Mafia and Happy Friday! Preview-Thursday 8/29 is Where the Bears Are Season 2 Finale- join us as we watch the last of the episodes this season at Hamburger Mary’s @ 630pm. All attendees are entered into drawing for some awesome swag! Welcome new members Rudey Lee, Wesley Williams, Mika Gilbert, Matthew Pagano, Gary Bear Man Lee and Doug Scheidemantel! Welcome gentlemen. We hope you can join us at one of the above events or one in the future. Stay home and do nothing this weekend? FUUURRRGET ABOUT IT! Don’t Forget – Harvesters Outreach this Saturday! Hey Everyone! We have scheduled a day to do some community outreach with the Harvester’s. It will only be for 2 hours in the morning and we could really use a good showing of support! We have signed up to fill back packs with food, and they would like us to get at least 25 people to work that station. This isn’t limited to just us bears, cubs, and other subcategories. Please invite other friends, family members, and even kids to come help out and support our community. I mentioned 25 people as the goal for number of volunteers, but it would be truly great if we can get 50 volunteers. Just think of all of the children and families we could be helping out across the metro with that many volunteers! Please help us show that we are a vital, growing part of our local community by coming to be a part of it! Our slot is from 10am to noon this Saturday 07/09/2013. Harvesters is located at 3801 Topping Ave, Kansas City, Missouri 64129. The annual Naughty Party is this weekend! It’s our annual holiday party! There will be games with prizes and an adult toy white elephant gift exchange! We will also be collecting new and unwrapped toys for the Good Samaritan Project! Tickets now available for Bear City 2 premiere! Get your double-feature tickets now! Your tickets will be available at the door if you pre-purchase by having either your receipt number or scanning the card you purchased them with. So please be sure to keep! 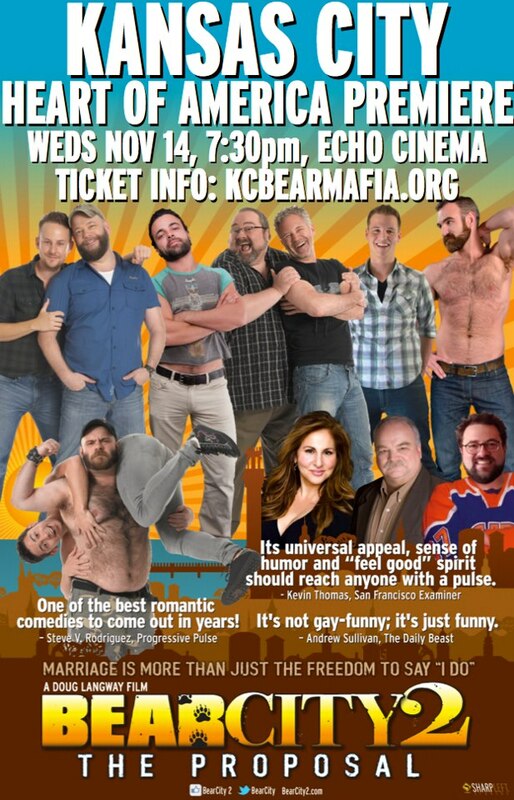 KC Bear Mafia Presents Bear City 2! We will be showing Bear City 2 at 7:30pm that evening. Haven’t seen Bear City 1? Come early and see the original Bear City at 5:30pm! $15 – Bear City 2Not only will we be showing the both movies there will be plenty of alcohol and food to enjoy during and between the movies. The brand new Echo Cinema and Barcade will officially open on November 1st. We will be amongst the first big events to be hosted in this fun and awesome new venue! As we get closer to the event we’ll be able to reveal more fun stuff taking place that evening! The Bear Prom 2012 page is updated and ready for you to purchase your tickets! Be sure to get them sooner rather than later as online sales will no longer be accepted as of October 1st! Date and theme for Bear Prom 2012 announced! The first ever Bear Prom will take place on October 13th 2012 and the theme is “The Growling Twenties”!